"Defense," 24, a professional gamer spends 3-5 hours a night gaming and streams his games out of a buddy&apos;s garage. 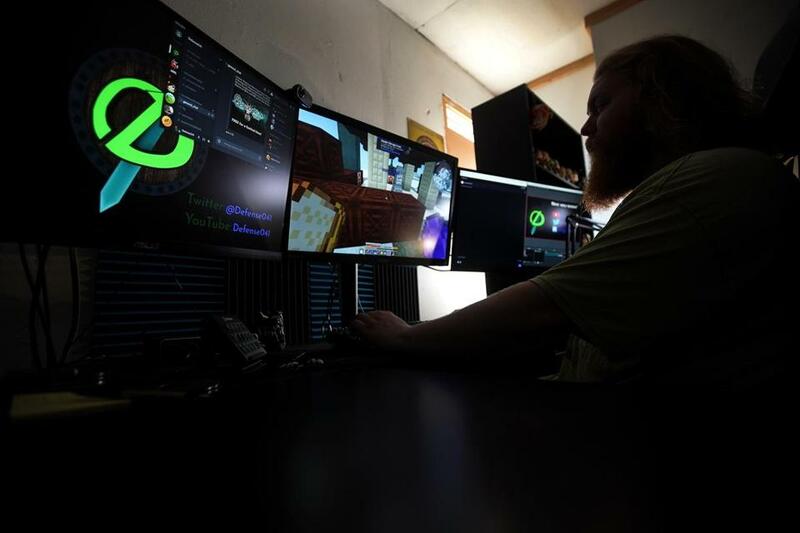 BILLERICA — In a dark garage at the end of a suburban cul-de-sac, a 25-year-old competitive gamer plays Minecraft and Super Mario games for hours. Most weeks, he spends more than 40 hours before a three-monitor display, sitting in an ergonomic desk chair. A black bookcase placed in front of the garage window blocks the sun. “I honestly look forward to it every day,” he said, asking to remain anonymous for fear of retribution from competitors, a common precaution in the gaming community. Online, he goes by Defense. Like many gamers, Defense was frustrated with the World Health Organization’s recent classification of compulsive video game playing, known as “gaming disorder,” as a recognized mental health condition. The disorder is characterized by impaired control over gaming to the extent that gaming “takes precedence over other life interests and daily activities,” the agency determined. The declaration has sparked controversy among gamers and clinicians over whether the disorder is legitimate or a symptom of underlying mental health challenges. The popular game Fortnite has renewed the debate over whether video games are dangerously addictive. A free game where players pay for accessories, Fortnite simulates a shrinking island arena where 100 players have to fight each other for weapons in fast-paced rounds. Legions of kids are obsessed with it, sparking battles with their parents over how long they can play. Defense may play as many as 20 hours over the weekend, but he says he isn’t addicted. He works full-time, socializes with coworkers, and sometimes goes camping with old friends. He logs off when he wants to log off. But other gamers say what started out as a fun diversion eventually became a full-fledged obsession. Before Tim Walrod quit video games in January, he had struggled for many years. In college, he played so much his grades suffered, and he would even leave parties to resume his game. When he found out he had missed an important deadline to apply to nursing school, Walrod knew his life needed to change. Walrod is still learning to fill the hours he used to spend playing. He meditates, trains for half-marathons, and takes long walks with his dog, cheered by the sunny weather at his home in Fresno, Calif.
Walrod also struggles with anxiety and depression. He views his gaming addiction as part of his broader challenges, not a symptom necessarily, but not an entirely separate problem, either. Many specialists say gaming disorder should be considered a stand-alone diagnosis, rather than a consequence of other mental health challenges. “It’s so important that these gamers are able to be taken seriously,” said Cam Adair, a recovering video game addict who founded the organization Game Quitters to help people like him. In a study published in ScienceDirect earlier this year, Adair and others found that 48 percent of those surveyed in the Game Quitters community reported some history of mood disorders. Considering gaming disorder as merely a symptom discounts the problems faced by everyone else, Adair said. But a study published in April in the International Journal of Environmental Research and Public Health found a 92 percent correlation between gaming disorder and anxiety, an 89 percent correlation with depression, and 75 percent correlation with social phobias or obsessive-compulsive tendencies. “You don’t want to focus on the symptom, that this kid plays a lot of video games. You actually want to treat the underlying condition,” said Dr. Jason Kahn, co-founder and chief science officer of Mightier, a behavioral health company that uses video games to help children cope with emotional difficulties. Jen MacLean, executive director of the International Game Developers Association, also criticized the “gaming disorder” designation. Yet clinicians said they have witnessed addictive behavior toward video games. Schlozman says he is “cautiously glad” to see the WHO classification, but said he does not want to demonize all video games. Amelia Nierenberg can be reached at amelia.nierenberg@globe.com. Follow her on Twitter at @ajnierenberg.